“My mother tells me that when I was born my mouth was small; I had a cleft palate and my small tongue kept falling backwards choking me. I was hospitalized for so long due to breathing and feeding problems that I was named by the visiting surgeon who operated on me. I have needed dental services all my life due to several carious teeth which needed extractions, filings, and root canal treatments. My teeth were also growing out of line and needed orthodontic treatment in high school and disimpaction in campus. My early exposure to dental professionals caused me to fall in love with the profession and dictated my future career choice in dentistry. Years later, my dream is fulfilled. 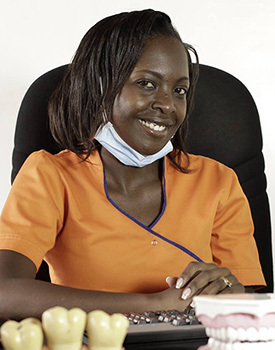 My passion is to create awareness of oral health issues and to promote prevention of dental diseases.